Emma has an obsession with cats. For as long as I can remember she has wanted one, but we have always put her off because of some allergies in our extended family. When she visits a home with cats, or sees one when we are out on a walk, I have to literally peel her away from the animal. She has a collection of probaby 15 stuffed versions that we’ve been using as substitutions since this obsession began. But this weekend, the day that she has been waiting for (i’ve been waiting for it to, by the way) arrived. 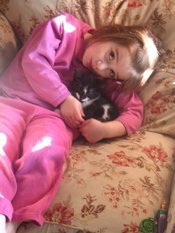 We adopted a kitten from our local shelter and presented it to her for her fourth birthday. Henry spent the first two days in the downstairs bathroom adjusting to life in our house, and to our giant yellow lab. I rarely saw Emma for those first two days. 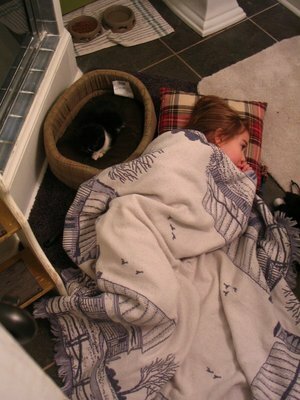 She was busy setting up house for her new kitten–food dishes, toys, and rearranging the placement of the litterbox and his bed countless times. She only emerged from the bathroom for an occasional snack. 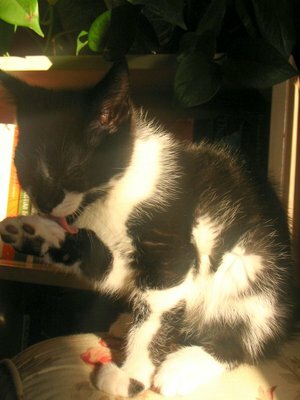 But now, life is beginning to get back to normal, normal with the addition of a scampering, purring, carousing kitten. Henry and Tripper have made peace with each other, in the sense that Henry just really doesn’t care about Tripper. And Tripper is smart enough not to show Henry too much of his muzzle after a big boxing of the nose. So, I’ll leave you with way too many pictures, but I just couldn’t narrow it down to any less…and a final shot of Emma’s birthday cake. 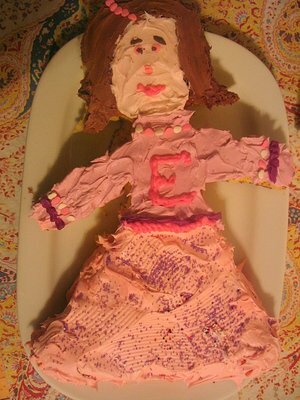 She requested a cake of HERSELF. Ugh! After the arm almost fell off and the head deattched at the neck, I was ready to trash it. But patience and motherly endurance to give my four year old the cake she wanted won out! And she was thrilled, which made it all worthwhile. So happy birthday to my sweet little Emma. I can’t believe that you are four years old. And I can’t wait for the wonderful year of four that is ahead, with all the newness that it holds. I love you–your big eyes, goofy laugh, and sassy dance moves. I love our snuggles in bed… songs about pretty little horses, doodle bugs and Jesus… playing with each other’s hair… painting nails…getting up to our elbows in art projects… gentle kisses and messy smooches… and I’ll even take your occasional attitude because it’s just all a part of what makes you, you and makes you mine. xo. What a sweet kitty! How happy ms. Emma must be. Great job on the cake, wow! Henry is very cute.Happy Birthday Emma ! I agree, your cake is fantastic. Wow! What a birthday cake, I love it! Happy Birthday Emma! Emma and Ian are just campaigning like crazy for a new pet. I miss my cats, they both passed away last year. 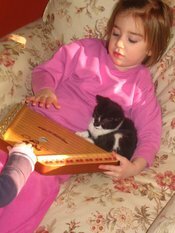 oh…Henry is too cute…He would like my Cricket :)…what an adorable little Emma you have as well…too cute! Precious pics! The one of your daughter asleep in the bathroom is absolutely dear. I love what you wrote about your daughter. I wonder if our blogs will still exist on our computers 20 years from now so they can read it. Thats wonderful that you recused Henry from a shelter. He sure is a little cutie and what a fab cake. Happy Happy Birthday Emma!! !The cake is adorable. The Kitten is one of the cutest I have ever seen. oh my goodness, i am all misty eyed right now, those are the sweetest pic’s of Emma and Henry, and that cake so the cutest thing I’ve ever seen. I am so happy for you and Emma! 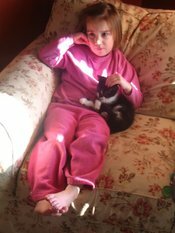 Henry looks like such a sweetie and is adapting extremely well 😉 I love seeing all the pictures – it’s never too many when there are kittens and children involved!